Gona is quite an experienced developer of add-ons for MCPE created a new modification. This time you get the opportunity to fly on a wooden plane with a propeller. 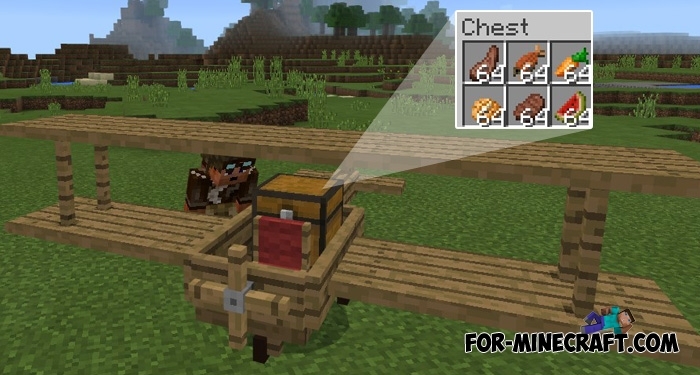 It fits perfectly into the concept of the game and has a chest on board. Therefore, this plane also performs the function of transporting your things. How to get the plane? In the ordinary world you can not find it, because the addon replaces the blaze. In this case, use a third-party program such as a Toolbox or select creative mode of the game. Then, open your inventory and take a blaze spawn egg. As soon as you spawn a plane, get on the plane and fly in any direction you want (iron sword used as a control wheel). The result here is a simple but at the same time very suitable addon.